Grocery store Aldi has been sued for injuries that occurred when a burger purchased there apparently exploded, causing injury to a consumer. The victim stated that she complied with all the packaging instructions, including those that listed the maximum cooking temperature, but the burger exploded as soon as it was put on the frying pan. She is suing the chain for permanent scarring, including burns, that occurred as a result of the accident. The case is still early, so we don’t have all the details, but the case is still a reminder of what consumers should and should not do when it comes to dangerous food that is purchased in grocery stores. The first thing that every consumer should do is read all instruction labels on food. Do not heat food up more than is stated on the packaging, or cook food in ways that are not listed on the packaging. This includes allergy warnings on labels, most of which (such as disclosing that items are made with peanuts) are regularly printed on labels. If you are injured because of a problem with your food, the failure to read or follow cooking or storage instructions will be the first thing a defendant brings up to challenge your case. You should save all receipts. Certainly, you have no idea beforehand that a food product will be defective or dangerous, so you may not even think about saving the receipt. However, if you are injured, the first thing a grocery store or food company will ask for is proof that the item was made by them and sold at their store. If possible, you should save any foreign object that you find in your food that may have injured you. This may not be possible if the item is ingested, and understandably, the first reaction to a foreign substance in your food may be to spit it out as far as possible. However, preserving the item–and for that matter, preserving the remainder of the food that had the item in it–is vital for the purpose of allowing experts to inspect both the foreign object, and the product itself. When food has a foreign body, or is defective in some way, the case is a products liability case–the product has malfunctioned the same way any other product would and it doesn’t matter that it happens to be food. 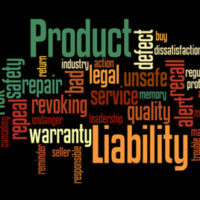 In products liability case, both the manufacturer and the retailer/seller can be liable for injuries. That makes it even more important to save packaging and receipts. This will help identify all parties who may be liable for your injuries. Even if only one party, such as the retailer that sold the product can be sued, the retailer has the same liability as the manufacturer (which is why many retailers will pull items off their shelves at the first sign of contamination or defect). If you are in any kind of accident involving a defective product, contact the Celeste Law Firm in West Palm Beach today for a free consultation to discuss whether you are entitled to compensation for your injuries.